China specialists make a parlor game of imagining what Mao Zedong would make of the People’s Republic of China today, with its capitalist-friendly Communists and young people more familiar with the theme song from Titanic than The East is Red. If the Olympics mark a turning point in the history of the PRC, isn’t it time to play this game with the games? What would Chairman Mao and Generalissimo Chiang make of the Beijing that has played host to athletes, journalists, fans and political leaders? How would the opening ceremonies have struck them? What about the media coverage and sporting events that followed? 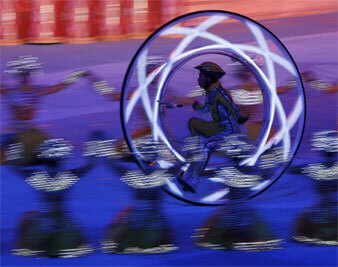 Let’s start with the ghosts of two competitors arriving in a pre-games Beijing. Much about the look of the city would shock them, since neither had governed a metropolis with skyscrapers and mega-malls. News that the metropolis was gearing up to host the Olympics would surely be a welcome surprise. Both Mao and Chiang had long lamented the fact that China of the early 1900s was derided as the “sick man of Asia,” a play on earlier Western references to the Ottoman Empire in Europe–each a once-proud place that now could be bullied. Both leaders stressed the importance of exercise, insisting that China’s lack of a strong tradition of vigorous sports had contributed to it being laid low by Western and then Japanese imperialism. The dream of China hosting the games dates back to the early 1900s, so each leader would be pleased this longtime wish had been granted. Once the ghosts got their bearings, their reactions to Beijing would begin to diverge. Mao would be delighted to see his face on most currency, but maybe a bit put off by the fact that some new banknotes feature the Bird’s Nest Stadium instead. And he’d be pleased to see that a giant portrait of his face still looks down on Tiananmen Square. These same things would infuriate the Generalissimo. As a Christian who had made the birthday of Confucius an official holiday during the Nationalist period (1927-1949), the religious situation would be somewhat gratifying to the Generalissimo and annoying to the Chairman. It is true that the only Christian churches offering services now are carefully selected officially sanctioned ones, like that recently visited by “Xiao Bushi” (Little Bush, as George W. is sometimes called to distinguish him from his father). The unofficial but increasingly popular “house churches” remain illegal. Still, the situation is quite different than it was on the mainland late in Mao’s life, when all manifestations of Christian belief were driven underground. As for Confucius, reviled by Mao as a feudal thinker, temples devoted to the Sage that were destroyed by Red Guards have been refurbished and new statues honoring him have been installed. Seeing such objects erected in the kinds of places where statues of Mao himself once stood (though there are still plenty of those around, too) would be hard for the Chairman’s ghost to take. The prominence of Confucius in the Olympics opening ceremonies is also relevant. He was invoked early on in the show, via a famous quotation of the Sage’s about the pleasure of having “friends come from afar” and a contingent of performers dressed as his disciples. This would have been a source of comfort to the Generalissimo’s ghost, an outrage to Mao’s. If any ancient figure deserved to be celebrated, according to the Chairman, it was the First Emperor of the Qin, known for, among other things, his disdain for Confucian scholars and their books. Neither ghost would have minded seeing those segments of the ceremonies that Western commentators have criticized as evocative of Nazi or North Korean rituals. The Generalissimo fought the Axis powers during World War II, but he was drawn at times to fascism; the Chairman and North Korea’s leaders often had similar approaches to spectacle. Moreover, both Mao and Chiang presided over National Day parades on their respective sides of the Taiwan straits that involved large numbers of people moving together in lock-step. What would have disturbed both was the quick march through China’s history, in which director Zhang Yimou skipped straight from the Ming Dynasty, represented by the giant ships of explorer Zheng He, to the late 1970s. This made it seem as if the anti-dynastic 1911 Revolution of Sun Yat-sen, the Japanese invasions of the 1930s (that both Mao and Chiang resisted), the Long March (that saved the Communist Party from extinction at the hands of the Nationalists) and the period from 1949 to the mid-1970s when Mao ruled the mainland (and Chiang ruled Taiwain) had never happened. The events of the twentieth century were of epic importance for China; to see most of it airbrushed out of the Olympic gala would disturb not only to the ghosts, but all who understand the dangers of a selective telling of history. He would’ve liked seeing China besting America in the collection of a valuable kind of mineral. The disastrous Great Leap Forward he launched, which contributed to a famine with a staggeringly high death toll, was aimed, after all, at catching up with and ultimately surpassing Western countries in steel production. We should remember that Mao touted the importance of female equality, via slogans such as “women hold up half the sky” and the introduction of a new, much fairer Marriage Law in 1950. As such, surely his ghost would have taken pleasure in success of China’s female athletes. As someone famed for his swims in the Yangzi River, Mao might have been delighted by the aquatic stadium and swimming and diving events. But he did value a governing party’s ability to control the news and give it a nationalistic spin–something that Chiang, also no slouch as a proponent of censorship, prized as well. And so, Mao’s ghost would have understood why the exploits of domestic athletes got more attention than did those of Michael Phelps on Chinese television. Most significantly, Mao’s ghost would surely have been pleased to learn that, while athletes based on Taiwan can still compete as their own team, they cannot use their national flag or have their national anthem played during the games. This is just one of many aspects of Beijing in 2008 that shows the degree to which it is the Communist Party’s spin on the “one China” theme, not the Nationalist Party’s one, that remains dominant. In the end, then, Mao would be the one most satisfied by the games. Geremie Barme, an Australian Sinologist who is a leading authority on both Mao and Chinese film, argues that there were subtle ways that the opening ceremonies invoked the Chairman. He notes that director Zhang Yimou took one of the Chairman’s watchwords (“using the past to serve the present and the foreign to serve China”) as his guide throughout. This is doubtless true, but there is nothing subtle about some aspects of the games that would have pleased the Chairman, including the makeup of the crowd. After being humiliated on 1950s trips to Moscow, forced to play supplicating “little brother” to patronizing Soviet leaders, Mao was eager to see a day when foreign heads of great powers would come to Beijing on Beijing’s own terms. So Mao’s ghost would surely have liked the sight of Putin and Bush sitting in a Chinese stadium awash with red PRC flags, watching a spectacle that most foreigners found impressive, even if at times also a bit disturbing. And as Barme reminds us, though there were allusions to Confucius in the show, many of the choreographers and performers responsible for it were from an organization that was always very dear to Mao: the People’s Liberation Army, which he had once led into battle and ultimately led to victory over the forces of Chiang’s Nationalist Party.